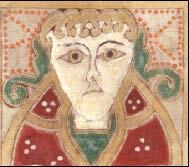 An example of Irish writing in medieval manuscripts. During the prehistoric period in Ireland, the native Irish developed unusual laws, clothing and habits, relatively independently from the Continental trends of the time. Their culture seems to have continued with few changes for many centuries, while the Roman Empire rose and fell. 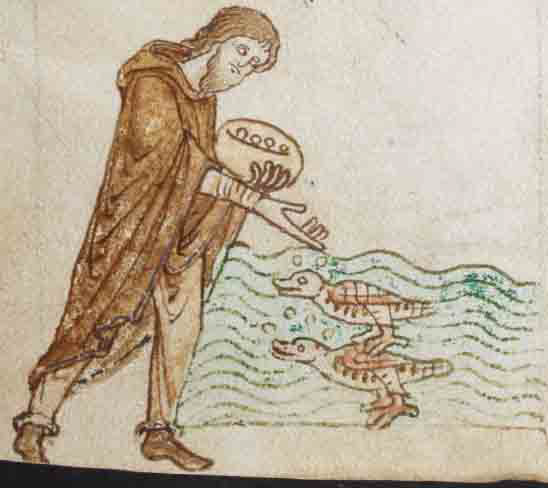 As Christianity arrived in the 400's CE, written records and pictorial representations of humans began to appear in Ireland. 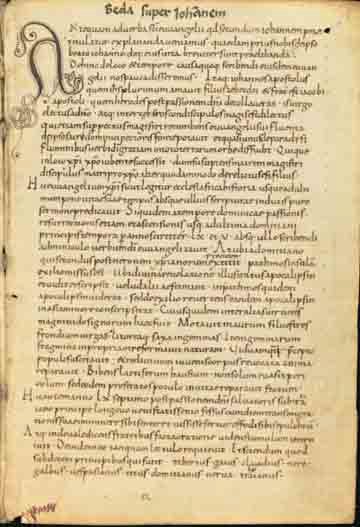 These early writings and annals, besides detailing events year-by-year, also include written versions of older oral traditions, giving modern historians a glimpse into the traits of the unique culture that preceded Christianity in Ireland. Unfortunately, many records and law books have been destroyed by subsequent conquest and oppression, but enough remains to give a coherent idea of what the early and mid-medieval Irish people wore, ate, believed and did as a society. Thanks to the recent efforts of archaeologists, translators and archivists, a wealth of new information is currently pouring out of Ireland—making research into Irish material culture suddenly more feasible. Modern efforts center on correcting errors, increasing the accuracy of translations and improving access to new archaeological discoveries. This paper looks into some evidence available today for the unique tunic with an attached hood that the Irish seem to have worn for centuries, perhaps from prehistoric times through the Norman Conquest. Much of this evidence is lexical, or dependent upon tiny extant textile fragments, or guesswork from illuminations—because at present, no Irish garments have been found intact from this period. These guesses may be further revised in the future if new discoveries prove more precisely how the Irish constructed their clothing. According to primary source accounts, such as the writings of Giraldus Cambrensis,1 the Irish differed dramatically from their neighbors in their style of dress. 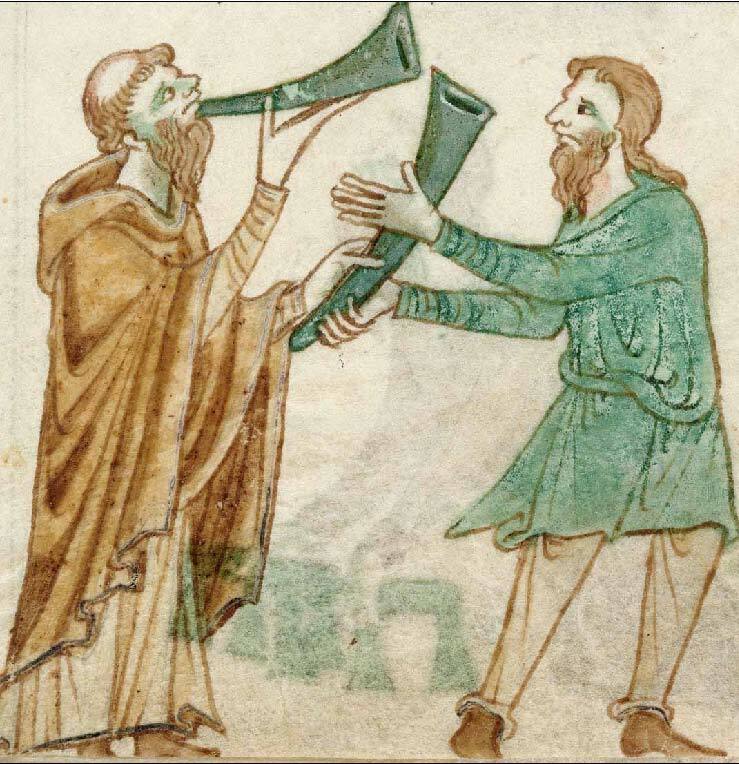 Foreign visitors were likely used to the more standard European garb, and found Irish dress startling (or even barbaric). The Irish knew of the styles worn by other cultures (from visitors and their own extensive travels and pilgrimages), and they used different terms for those than the words for their own garb. For instance, the Irish term for a cowl or hood attached to a jacket is “cochall.”2 This switched to “Gall cochal”3 when referring to the Norse hood, which was a separate article of clothing and covered the shoulders. Meanwhile, the Irish term for any hood attached to a tunic is “culpait,”4 and this word is never used to refer to foreign dress. Although the Irish had many styles of shirts, tunics, vests, coats, pants and cloaks, the basic long tunic–called the “léine,”10 which is usually written as “lénte” or “leni” when plural—seems to have been the most common item for men and women of noble rank to wear. Spelling in ancient and medieval Irish is quite variable from one manuscript to another, so many versions of these same words appear in the written records. Although pictorial evidence is limited, characteristics of the tunic are well documented in text. Linen: The léine is most commonly described as made of linen, when the textile is defined. The Irish word for linen (specifically from the flax plant) was “lín.”11 Thus, the name of the tunic predominantly made of linen was unsurprisingly similar. There have been suggestions that the nettle plant (ramie) was in use for producing fabric in Ireland prior to and contemporary with the rise of flax, but references in the text to cloth made from nettles is hard to isolate, if it exists. Other bast fibers may have fallen into the group heading of lín, such as linden/basswood bark. Still, in most instances, lín clearly refers to flax planting and harvesting, and the cloths and clothing made from it, such as the léine. 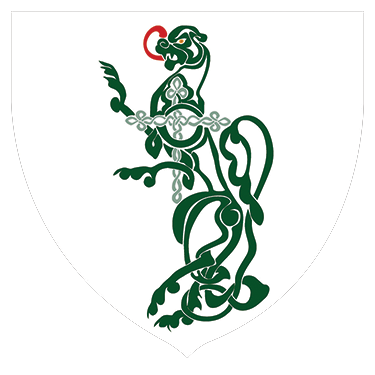 It is worth noting with this passage that in fair weather the léine was an appropriate outer layer.As The Destruction of Da Derga's Hostel continues, Da Derga himself is described as wearing a “green cloak and a shirt with a white hood and a red insertion.”4 This may mean the white léine had a red lining in the hood alone. Similarly, the three sons of Baithis of Britain have white hoods with red tufts5 at the ends, presumably to show off their status by wearing more of their permitted colors. The exact phrase for her “bright-hooded” dress is “lene gelculpatach,” 8 as opposed to the “lenti culpatacha”9 of the third band of Cormac's men. Thus it seems likely that this hood itself was of a bright color, distinct from the rest of her léine. From these two passages one may observe that the léine culpatacha belonged neither to male or female clothing exclusively, nor to one particular class. Note: Another word for hood in Irish is cochall, but this seems to mean cowl or hooded cloak rather than anything associated with the tunic. This also applies to cochlach (hooded, wearing a hood), cochlán (cowl, little hood), and cocúae (lining of a hood, inside hollow of the hood). Only the term culpait seems associated with the léine; when not called a culpatacha, culpait follows the words “lene do”or other such phrases joining the two meanings together. As the Irish adored color and often described wealthy classes as wearing “gel,” or bright clothing, it is reasonable to assume that the ideal léine culpatacha would be of a bright, vibrant color. Furthermore, the hood itself could be made entirely of a different color from the rest; it could be made of the same material but lined in a contrasting color; it could even be made of many colors sewn together. In the time of Tigernmas were purple and blue and green first put upon garments in Ireland. this is what authorizes all the colours at present...”12. Given this account, one may assume that the richer colors of purple, blue and green were limited to nobility. According to Thomas Kinsella, in The Tain, the colors used in Irish dress were, “purple, blue, black, green and yellow, plain grey and... yellow-brown,”13 along with combinations and patterns. Other translations name crimson red as one of the prominent colors for the wealthy. Dim or dark colors are associated with poor, threadbare clothing and lame, sick people. Whitley Stokes translates the old witch's clothing in Da Choca's Hostel, “brat longach roríabach immpe,” as “[s]he wore a mantle threadbare and very dusky,”14 with ríabach being the usual word for dark, dusky and brindled. Although there may be no extant listing of which precise colors belonged to which classes, it seems logical to assign dark or undyed clothing to the lowest, the slaves. Undyed clothing would be dark by nature at the time, as Gerald explains: “nearly all they use is black, that being the colour of the sheep in this country.”15 A poor freeman may have owned clothing that was dyed, but only poorly— such as the gray brat mentioned above. Yellow being relatively easy to achieve, this may have been the next, or third color. As one rises through the ranks, it becomes imperative to decorate with as many colors as should be permissible for the appropriate status; thus, hoods with different colored tassels, linings, or embroidery. Textual references seem to indicate that gold, silver and red threads were popular choices for decoration among the wealthiest classes. Lénte culpatacha often have embroidery in their descriptions, although the texts do focus on the clothing of the rich, so one may assume that not everyone could afford to adorn themselves so extravagantly. Still, in many statues one finds the bottom hem of the léine carefully detailed with embroidered patterns. 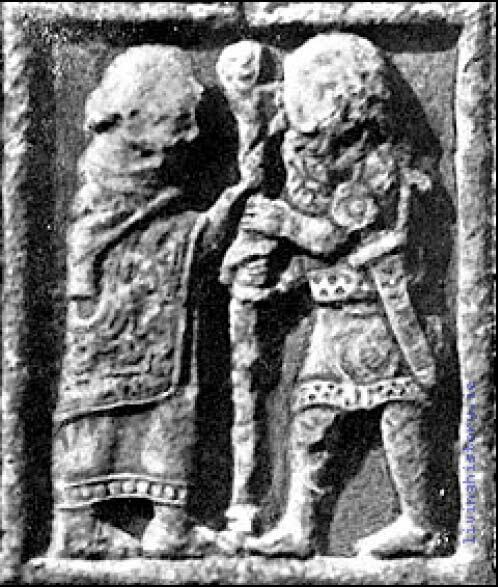 For instance, in the Clonmacnoise Cross's section with two chieftains, one can see stripes of decoration running up the entire lower half of their garments. Meanwhile, on the southern side of the 11th century Cross of Muiredach,16 one can see a beautiful carved pattern similar to the embroidery on Mary's neck in the Book of Kells, above. Such patterns are likely the best source for medieval decorative designs, given our lack of extant pieces from this time. As mentioned above, three men in Da Derga's Hostel wear red tufts on their hoods— presumably, these are tassels or some early form of pom-poms sewn to the points of their hoods to show off an additional color. However, in most descriptions the brat carries the heaviest decorations, with feathers or beads sewn on to the richest item of clothing and the léine mentioned only for its color. Therefore, although the léine should have some adornment of hems at the bottom, sleeves and hood, it seems that Irish tastes did not favor outrageous additions to their primary garments. Thus some editing should be involved in one's creativity with this stage of the léine. Irish tunics in illustrations where they are not hidden by the brat seem to have one of three distinct necklines. First, they have a scooped, round neckline like many other cultures wore; this can be seen, for example, in the Book of Kells. 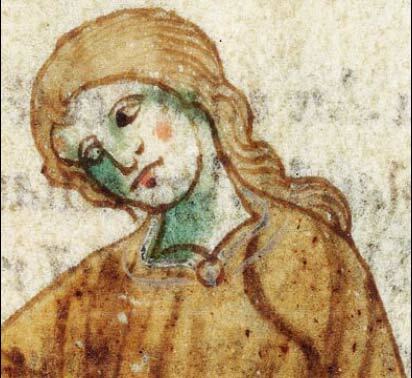 One angel, for instance, wears a golden-yellow ionar over his green léine with white trim. The léine has a clearly circular scoop neckline where it shows under the ionar. This neckline could be a flattering way to make a tunic with a hood without pulling fabric against the front of the neck. The round neckline, however, seems the easiest to construct if one wishes to attach the hood. 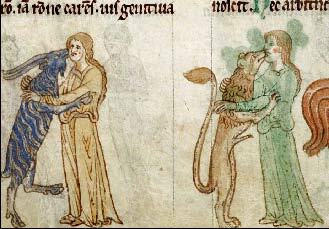 As can be seen from Gerald's depiction of the beast-loving women, the léine could be full-skirted and reach past the ankles for female garb. The body of the léine was loosely fitted and could be hitched up with the crois (woolen or leather belt). The sleeves began loosely but tapered down to a tight fitting around the forearms. A man's léine had similar sleeves, but only came to about knee height. It could be worn with or without a crois. On the men in the image below, the léine seems to generally have a contrasting color from the trius, with the single exception of the man butchering the horse on the left. Since his clothing is all of one color, it seems likely that this man is the servant or slave of one of the men feasting on the right. His occupation while they eat indicates this role as well. The Irish hooded tunic, or léine culpatacha, died out eventually and gave way to more Continental designs. 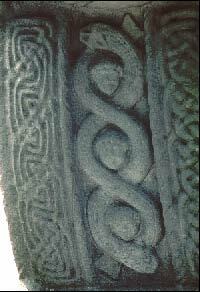 However, for years throughout the Early Medieval and Middle Ages, this article of clothing could have been seen among any ranks and regions of Ireland; linen in summer as the sole garment a man or woman would wear, or in winter made of wool or worn in layers under ionar and brat for warmth. It varied greatly in color and decoration, length and style of neckline. A nobleman or king might wear one of many colors and fabrics, with metal embroidery and fringes or other such adornment. A poor woman might wear a dingy black one, having only the one garment to her name. Certainly, the item served as a statement about one's status, as well as a comfortable, flexible piece for wear year-round. Modern reenactors may find this tunic attractive for its similarity to the contemporary hoodie, and for its easy, loose-fitting body construction. 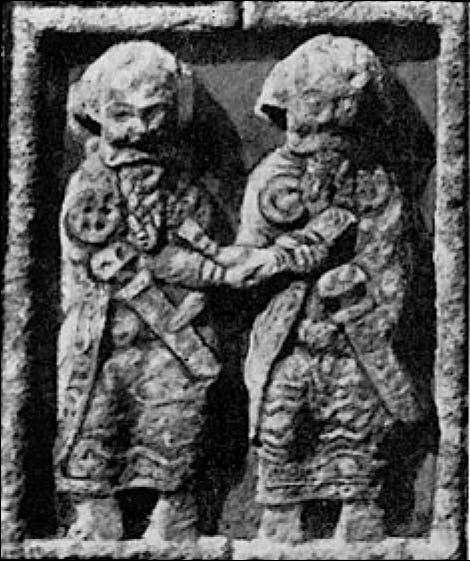 However, the main goal of this paper is to document, for those with an interest in ancient Ireland, the real alternative to the unrealistic kilt, the later-period Moy Gown, the 16th or 17th century Shinrone dress and the bag-sleeved, pleated chemises under laced bodices, from later times still. Many sites and pattern-sellers claim that the léine was a simple t-tunic, the brat an undecorated rectangle, the ionar a kite-shaped sleeveless jacket for men alone, and the trius simply pajama pants. Alternatively, they may claim the 17th century dresses as medieval garb, resulting in many reenactors wasting their money and time making clothing centuries too late for their personas. These sites are enormously frustrating in their lack of citations or any indication of research whatsoever. By contrast, primary sources show that the léine had fitted sleeves, the trius had fitted legs, the ionar had long sleeves for winter or for women (or anyone who did not need the enhanced mobility of a soldier) and the brat could have all sorts of adornment, depending on one's status. Although with time these fashions died out (or were put out, by English mandate), for many centuries this would have been the appropriate clothing for any Irish man or woman. Though this paper focuses on the possibilities for a léine culpatacha, many of the sources cited here can also supply information on the other articles of Irish clothing. For more on Irish garb as a whole, Scott Barrett's 2006 paper on Early Gaelic Dress19 provides a great overview. For an overview of constructing historic tunics (without the hood), see I. Marc Carlson's web page on Some Clothing of the Middle Ages: http://www.personal.utulsa.edu/~marc-carlson/cloth/tunics.html. 3 Stokes, Whitely, trans. "The Destruction of Da Derga's Hostel" Epic and Saga. New York, P. F. Collier and son, 1910, Harvard Classics no. 49. 6 Stokes, Whitley, trans. "Da Choca's Hostel." p. 155. Revue Celtique. Ed. Emile Bouillon. Paris: Kraus Reprint, 1900. Togail Bruidne Da Choca. Internet Archive. 10 MacNeill, Eoin. Ancient Irish law: the law of status or franchise. Dublin: The Royal Irish Academy, 1923. Vols. XXXVI C 16 of The Proceedings of the Royal Irish Academy. .
11 Id. p. 275 V. 70.—27. 13 Kinsella, Thomas. The Tain. Oxford UP: Oxford, 1990.